This year’s poster features an iconic photograph by Joel Sackett of audience members at a screening of It Came From Outer Space at Celluloid 2005. Bainbridge Island’s homegrown film festival made its twentieth appearance November 17 and 18, 2018. Once again, the Historic Lynwood Theatre’s silver screen lit up with dozens of local films, delighting audiences with visions of the island stretching back forty years. Since 1999, Celluloid Bainbridge Film Festival has been presented by Arts & Humanities Bainbridge. In that time, it has showcased hundreds of films with a connection to Bainbridge Island, either filmed here or made by island residents. To celebrate this legacy, this year we offered up a retrospective selection of quirky favorites from two decades of Celluloid. Festival-goers revisited the highlights of the festival with films like “Boomtown,” “Outsourced,” “The Gefilte Fish Chronicles,” and “Birth of a Salesman.” This year’s featured film was “The Fundamentals of Caring,” based on “The Revised Fundamentals of Caregiving,” the best-selling novel by island author Jonathan Evison. The retrospective was co-curated by Kathleen Thorne, the festival’s founder and mastermind, and TJ Faddis, former long-time manager of the Lynwood Theatre. From feature-length dramas to documentaries, comedy shorts, and experimental music videos, the films in this year’s lineup represented the creativity, the hilarity, and the heart that have defined Celluloid from its very beginning. The festival began with an Opening Night Reception at the Marketplace at Pleasant Beach. Guests enjoyed fine food and drink and heard from AHB Executive Director Anne Smart as well as special guests Jonathan Evison and Kathleen Thorne. Kathleen was presented with a commemorative achievement award in recognition of her role in bringing Celluloid to the island community for so many years. Sunday saw a full day of retrospective screenings, with local films from 1976 to 2016 making appearances. Hundreds of islanders showed up to revisit favorite films of the past. In recognition of their contributions to the twentieth Celluloid Bainbridge Film Festival, we want to express our thanks to Kathleen Thorne, TJ Faddis, Jonathan Evison, Case Levenson and Ruel Johnson, Jeff Brien and Pat Patton of Faraway Entertainment, Keith Brofsky, Diane Bonciolini, Natalia Clermont, Ethan Currier, Jason Erickson, Joel Sackett, Ron Stewart, Rosario Treviño-Yoson, the entire staff of the Lynwood Theatre, Flowering Around, the Marketplace at Pleasant Beach, the City of Bainbridge Island's Lodging Tax Advisory Committee, and the many filmmakers who have contributed to Celluloid over the past two decades! Since its inception, Celluloid has been presented by Arts & Humanities Bainbridge. An important part of AHB’s mission is to nurture and grow programs that can eventually take wing as stand-alone arts institutions. In the course of twenty years, we’ve made Celluloid an indispensable feature of the island’s creative landscape. As AHB refocuses on our primary role as a connector to and within the island’s cultural sector, we think Celluloid Bainbridge Film Festival is ready to transform into an independent event. We’re handing the festival’s considerable legacy over to a team of community members who are interested in piloting the festival into the future. We’re already in the process of reviewing proposals and welcome the community’s interest and enthusiasm. Send us an email at admin@ahbainbridge.org if you’d like to get involved with the festival’s future. 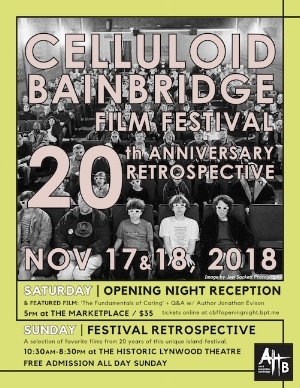 We would ideally like to see the festival continue as a venue for local filmmakers and films with a connection to Bainbridge Island, but we’re also excited to see Celluloid continue to grow and change. It’s been a tremendous pleasure to serve the local community of filmmakers and film enthusiasts and to offer an experience that is truly representative of Bainbridge Island. Thanks to everyone whose participation has made Celluloid Bainbridge Film Festival possible throughout the years.